The motorsail—more motor than sail—from Belhaven, North Carolina, back to my home port of Oriental had been rough. A late June storm brought overcast skies and gusting winds that meant constant sail trimming, and I was tiring as the day progressed. I was alone onboard Anticipation Too, my Hunter 420, my crew having left me earlier, to bring the boat home by myself on the last day of a 15-day cruise around the inner coastal waters of North Carolina. After crossing the Pamlico River, with the end of the passage in sight, I decided I was too worn out and took in the sails. As I entered the Bay River, the wind came up to a steady 20 knots, gusting to 30-plus, and began to push the seas into a steep, choppy mess. I was glad the sails were down. Then it began to rain. The forecast called for slightly worsening weather that would not improve until later that night. I needed to head home the next day and wanted to be back in my slip before nightfall, so I pressed on. The next time I looked, the boat had turned sharply and its sails were down. I soon realized it was moving all over the place with no apparent purpose. Then I saw something in the water between the swells, maybe 300ft from the sailboat, and it looked like a person. I grabbed my binoculars and could now clearly see not one but two people floundering about in the turbulent water, with the small sailboat seemingly unable to steer toward them. I could also see that at least two people were still aboard: one was trying to steer the boat using the outboard motor, while the other appeared to be watching the two men in the water. I immediately radioed a PAN-PAN message to the Coast Guard and told them everything I knew, while turning my boat toward the people who’d gone overboard. I could see that only one of them had a lifejacket but wasn’t wearing it; he had his arms around it, clutching it to him. As I updated the Coast Guard via radio, I circled the closest man and deployed my new Lifesling, which had replaced my aging throw ring. Following procedures outlined at a man-overboard seminar I’d recently attended, I encircled him with the long line attached to my boat. I stopped the boat and yelled to him, “Just grab the line and hold on, I’ll bring you in,” after which I pulled him up to the boat and onto the swim platform. I could see he was very tired, so I quickly got him up the stepped transom, onto the deck and seated securely. As I returned to the helm he started to get up to pull the Lifesling line in. I quickly told him to stay seated so I wouldn’t have to rescue him a second time. After that I put the engine in gear again and circled around the second man, the one without a lifejacket. He was closer to the small sailboat but could not get to it because it was still moving about like a butterfly in a windstorm. I circled tightly between them and pulled up closer so the line would come right to him instead of him having to swim for it. Again, I stopped my boat and, as he held tightly onto the line, began to pull him to me. Hearing something, I looked up and saw that the out-of-control sailboat was now headed straight for my starboard side! However, the MOB was still 30ft away and clearly in trouble, so I kept pulling him in. I knew my boat would be hit, but I had to get the man out of the water as quickly as possible. 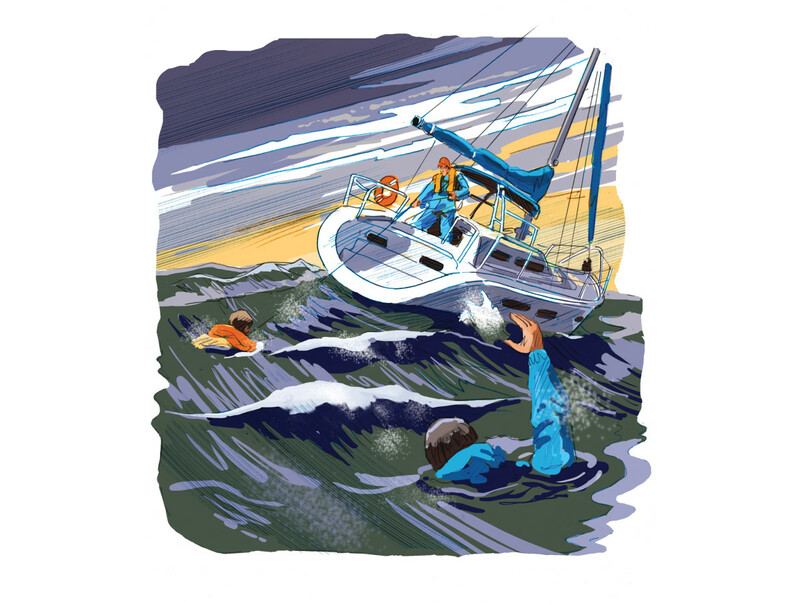 Just as as I pulled him up to the swim platform—BAM!—the sailboat hit Anticipation Too amidships, then bounced back, veered to starboard and drifted away. I got the second victim into the cockpit and seated him next to his friend. As soon as I’d motored a safe distance from the small sailboat, I informed the Coast Guard that the two people in the water were now safely aboard my boat, and that the other sailboat had lost steerage and needed a tow. They asked if I planned to tow them, but having been hit once I wasn’t keen to get near them again. One of the rescued men gave me the boat owner’s contact details, which I passed on to the Coast Guard. I told the Coast Guard I would stand by until the towing vessel arrived and the situation was under control. The rescued men told me the tiller had come loose from the rented sailboat’s rudder, and it could not be steered. “We jumped in thinking we could turn the rudder from the back, not realizing we couldn’t even keep near the boat, not even close,” one of them said. I didn’t ask any questions about whatever equipment they may have had. However, they volunteered that they only had a cell phone, which they had been unable to call out on. Soon the sailboat’s owner arrived on the scene in a motorboat to take the sailboat in tow, and I headed into Oriental Harbor with my two passengers. I radioed the Coast Guard to let them know the men were safe and I was returning with them to my marina. After getting settled into my slip, a neighbor volunteered to take the men back to their friends, and I finally had a chance to reflect on the day’s events. I recalled from the seminar that one of the instructor’s key points was to practice MOB skills at least annually and to also remember the importance of equipment maintenance. In my mind it’s just like seatbelts, you hope you never need them and very few ever do, but there is always that chance and you want to be ready. It made me wonder—had I not just attended the MOB seminar and still had my old throw ring with a much shorter line, would I be in the slip now or watching the Coast Guard search for bodies?